Good morning! Happy Son-day to you, and welcome to Day 1 of Peachy Keen sneak peek and reveal week! 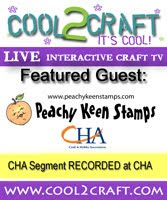 I've got a cute and fun little tag to share with you that I created with some of the fabulous new stamps and the Peachy Picks Papercrafting Kit that will be revealed this Wednesday. Here's what I have to share with you today. Isn't she cute?!!!! Oh what a sweet little witch she is, and oh, so much fun to color. Of course I did that with Copic markers. The kraft tag, ribbon, rhinestones, card stock and patterned paper are all a part of this month's Peachy Picks Kit. That sweet little witch? Well, she's only a part of what may be the most fabulous Stamp of the Month set you'll ever see! Did I tell you that you're gonna love it? Well, you will. You really, REALLY will! Here's all the info you'll need about what's going on this week at Peachy Keen Stamps, and just exactly how our release week works. Good stuff to know, right here. 1st of the Month - Stamp Club Members (yes, we have an auto-ship club, oooh la la - you can sign up for it here) get an exclusive first look at inspiration samples and a full reveal of the stamp of the month kit! We also have a papercrafting kit - Peachy Picks, and those previews are sent out on the 1st as well. 2nd - 4th of the Month - EVERYBODY gets to see sneak peeks of the entire release showcased on our blog. I also have GREAT news on our NEW RELEASES! Starting on the 5th of each month, only our new releases will be available at a special discount for a limited time. The discount and timeframe will be unveiled on September 5th so DON'T FORGET to check back here or on our website - you won't want to miss it! Thanks so much for stopping by today! Be sure to drop by the Peachy Keen Stamps Blog and check out what some our other talented ladies have created to share with you. Peachy awesomeness at it's best! Wishing you a blessed and beautiful day and some happy stamping, too! I believe you Lorie, I REALLY believe you! lol This likkle witchy is SO cute! Can't WAIT for the release. Kathy is out on her own for thinking up such wonderful cuties for us!! (Not forgetting how good you are at colouring 'em my friend)! Wow Lorie! This is so cute! Love that tag and your coloring is amazing as always! Wow That looks awesome my friend. Great Coloring like always, love the purple hair. I flipppen LOVE this !!!! YOUR COLORING IS SOOOOOOO amazing !!!! This is totally cute! What great coloring & love all the added bling! TFS!!! What a cute little witch! I your tag is adorable:)I can't wait to see the entire release! Just about the most adorable little witch I've ever seen! And she's all decked out with such flair! Love it!! Your coloring makes my jaw drop every time! Love it!